Patch Tool is great for under eye area. Press ctrl + J to duplicate the original layer. Circle the under eye area that you want to edit and drag that selection to an area that you want to use to fix this area (clear skin area). If the result is too heavy, lower the opacity of the layer. You can also use the Stamping Tool to cover the under eye area. If you use the Stamping Tool, from the options bar change the Effect Mode to Lighten and Opacity to 33% and choose Sample All Layers. You don’t need to remove all the imperfections under eye area because you don’t want the end result to be over retouched. Remove blemishes with the Spot Healing Brush Tool. Add a new empty layer and select Spot Healing Brush Tool. It’s good practice to work non-destructively and never work on the original image directly. It’s also good that you can quickly compare the progress you’ve made by turning on/off the visibility of the new layer. So now once you got your Spot Healing Brush Tool selected, from the options bar select Sample All Layers and start going over the imperfections and blemishes that you find. This step is optional and it depends of your subject. For e.g. if your subject has big pores this step is something worth drying. The results aren’t perfect and there are definitely better methods out there but you can get decent results with the Mixer Brush. If you have never used it before it’s good to give it a try. Select the mixer brush and I suggest you put this in it’s own (blank) layer so that you can adjust the opacity or erase parts if the effect gets too heavy. For the mixer brush I choose: Load the brush after each stroke and Clean the brush after each stroke, Flow 10%. Also choose Sample all layers. Luckily there are some Photoshop actions that can make retouching a bit easier and help you with the work flow. 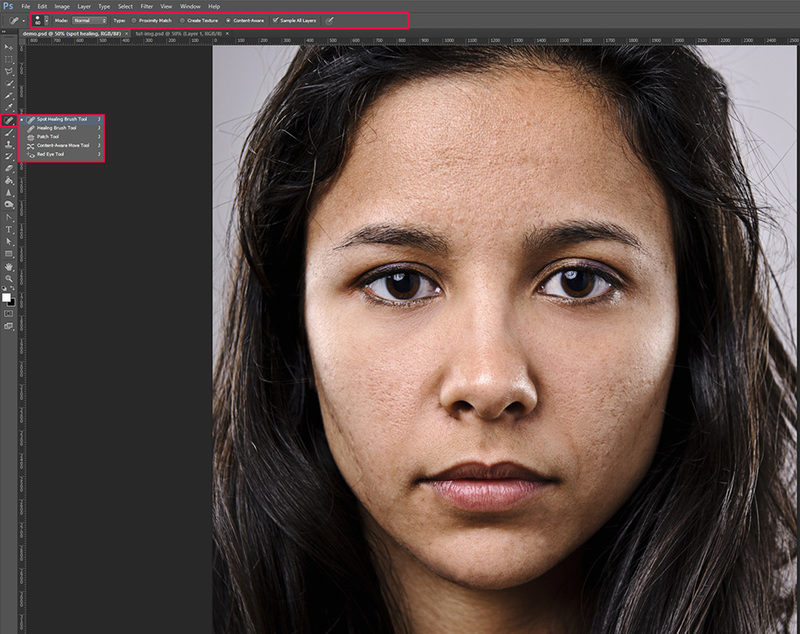 Skin Retouch by Graphicadi is great, affordable action set for skin retouching. One retouching gig and you have earned your money back and then some.